Our CVMA patch has a very significant meaning to all of our members which is symbolized as follows: Red, representing the blood that has been shed on the battlefield. Military Gold, representing all branches of the military service of the United States. Black, representing the heavy hearts possessed for those who gave their lives and for those that are considered missing in action or prisoners of war.he Skull and Ace of Spade represents the death that war leaves in its wake. ​What does it mean to see a person wearing this patch? All of our Full Members are U.S. Armed Forces Combat Veterans. This means that each and every person wearing the patch – as pictured above – served abroad during wartime in a Combat Zone declared by Presidential Executive Order. Many members served in Vietnam, Iraq and Afghanistan (to name a few). There are other membership types including Support Members – who served in the U.S. Armed Forces; and Auxiliary Members – who are spouses of Full or Support Members. In May of 2001 the CVMA adopted the CVMA/VFW patch. This was done with the VFW's ok as all CVMA members were or became VFW members and entitled to wear the VFW patch. Over the next year and a half the CVMA was well accepted at Post and Division levels with the VFW. Many meetings, conversations and letters over this period with the VFW National always sounded positive but with no results of developing a relationship. In December 2002 the CVMA membership voted to move on towards the Association it wanted to be. 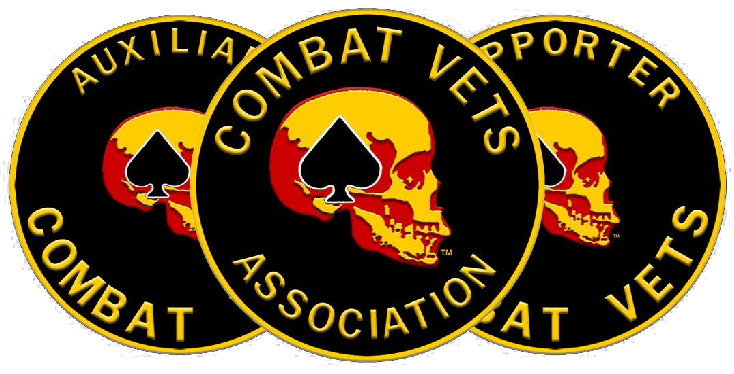 Along with this VFW membership was no longer required opening the CVMA up to all Combat Veterans who ride a motorcycle.On December 15, 2002 it was voted the CVMA would wear a combination of the CVMA background and the old skull logo as a one piece patch. Membership requirements being a new member had to be a Combat Veteran and ride a motorcycle as a hobby. This patch is worn by Full Combat Members only.